Can you find me? It’s like Where’s Waldo! Some of you may have spent the last few (or more) months wondering what has become of this little blog. Our fearless author, Alisha, it seems has to have fallen off the face of the planet to have been this silent for this long. Where you’ve been going for your weekly dose of missionary humor and cute little girl stories, one can only wonder. But fear not, gentle people! I have returned, and have a story of semi-epic proportions to tell you. It’s so big, I’m going to tell it in multiple installations. And, contrary to common belief, it does not begin nor end with my recent trip to Nicaragua. So pop some popcorn, settle into your seats, and read on! We all know that I came down to Mexico kind of green. You can see in some of my earliest posts, I had no clue really what I was doing. I just wanted to serve and love the kids, so that’s what I did. But the thing about Esperanza Viva is it’s SO BIG. The ministry itself is huge, and the vision that this place has of what they want to accomplish is even bigger. I found myself a little spoke in a great big wheel, and I started to get lost. Like everyone, I have my own issues, and I let myself get wrapped up in them. Suddenly, my life was no longer about serving God-it was all about me, my worries and my concerns and my wardrobe (yes, I am that shallow. I know it’s a shock). When you’re a missionary, everything in your life is about serving God-almost everything I do is in some way or another, tied to the ministry. What I found out was that sometimes, when everything is about serving God, in the end nothing is. I was really good at rationalizing my behavior, but in my heart I knew I was messed up. Old attitudes and fears I used to have returned, and all I could think about was all of the things I had to do. I stopped doing the things I loved-running, playing with the kids, writing-because I was so wrapped up in the stress of all of the things I had going on and the drama of all of my worst issues slapping me in the face every day. This is about the place I was in when I left for Nicaragua. I will be honest with you, I was at the point where I didn’t even want to go. I was exhausted, I wasn’t on speaking terms with God, and I didn’t want to contemplate even one more thing that I had to do. I was so done, and the last thing I wanted to do was get on a plane and go to a foreign country to hang out with people I didn’t know and do more work. I really had a stellar attitude going. Three of us from Esperanza Viva-Puebla went on the trip (myself, Ruth, and Miguel), along with another from Nations Church (Cecy). Well before the crack of dawn on Thursday we were on a bus to Mexico City, where we would be joined by Ita, who was coming from Esperanza Viva-Matamoros to round out our group to five. When we reached Nicaragua we would be joined by the other four members of our team, traveling from the United States and Nicaragua. So, Nicaragua everyone. It’s amazing. Beautiful. Sunny. There’s palm trees everywhere, and they have coconuts on them. The mountains are green, the sky is blue-really, what else could you want. The only thing that’s out of place is the desperate poverty a lot of people live in. This is actually what I want to talk about. Living in Mexico, I have been known to think I have it rough. And it’s true, Mexico has its own issues. The government is corrupt a lot of the time, people are closed off from the gospel, there’s a lot of abuse of women and children, and there’s a lot of alcoholism, drugs, and drug trafficking. This is all true of Mexico. But there’s also paved roads a lot of the time, a functioning government, help for people in need, medical care, and all sorts of other things like Starbucks and Doritos and the Mac Store. Those of you who have been to Mexico, (like, actual Mexico, and not Cancun or Acapulco), I want to you think about how you felt when you first saw what it’s like here. People living on the street, beggars, children doing tricks for coins at stoplights. Do you remember what you though? Do you remember the Lord starting to tug on your heart, and thinking of all of the things that you daily take for granted? That was how I felt in Nicaragua. I was shocked by the sudden realization of how good I had it in Mexico. I felt the Lord tugging on my heart for this place before I even actually met a Nicaraguan person. Something began stirring in me as soon as the plane touched down, and for the first time in a long time, I started to feel something besides exhaustion and stress. I felt hope. The first couple of days of the trip were very relaxed. We all got to know one another in the group. Ruth and Cecy proved to be a good team, helping around the houses we stayed at and always willing to lend a hand in anything. Miguel was our pastor and worship leader, ready with a sermon or a song at all times. Ita was the photographer, and was charged with recording our journey for posterity and LHI Missions. Aside from “us” Mexicans (you know, since I’m so Mexican), Jim came from Wisconsin, and provided us with pithy opinions and stories from missionary life in Mexico in the 80’s all week. Danielle from Pennsylvania, and is possibly one of the sweetest people I have met in a long time. She was in charge of giving people prophetic words, ministering to them, and making people cry. Scott is from Texas, and was our contact man-the leader of the group and the person who knows everyone. Finally, Joe came from outside of Managua. He was our resident Nicaraguan, cultural guide, and comic relief for the trip. Our first stop was the “city” (town may be a better word) of Darío, where the famous Nicaraguan poet Ruebén Darío was born. The game plan was simple. While we were there, we were going to do a service with a local bible school, do some evangelism around the city, and have another church service at a local church. Our schedule was pretty open, and made even more open by the Nicaraguan practice of not paying close attention to the clock. Over all, pretty simple, right? Wrong, dude. So wrong. Friday night brought us to the local Bible school, run by Ana Sara, a Swedish expatriate living in Nicaragua. She founded the school a few years ago, and accepts students from Nicaragua and Sweden once a year for their nine-month course of study. We showed up ready to minister to the students, they were there ready to minister to us, and in the middle of all of it, God showed up. It was amazing, being in that room surrounded by voices calling out to God in different languages, all with the goal of knowing Him more, feeling His presence. That was the first time in a long time I felt something in me begin to break-in that room, worshiping God and praying for the students. The next day, our first stop was to Pastor Jairo’s house for lunch. I need to mention here, there were shishkabobs. With steak, AND pork, AND chicken. I’m not sure how many I ate, but I was happy. Actually, during the entire trip the food was beyond good. I’m amazed they didn’t have to roll us out of the country. We ate lunch with Jairo’s family and friends, and members of the church began showing up for the evangelism we were going to do. Since it had been decided that it was going to be more of a children’s thing, earlier in the day several member of the team had gone out to get a piñata. I need to explain something here. Mexico invented the piñata, in case you didn’t know. We are a little snooty about them-there’s a whole process for making them, different style piñatas for different occasions, etc. It’s a whole thing. So when they came back with a poorly made piñata of Winnie-the-Pooh’s underfed brother, we were skeptical, to say in the least. Our skepticism grew as we opened up the bear to shove candy in him, only to find he was already full of newspaper. Ruth posed Jairo the million dollar question: Why was the piñata already stuffed? 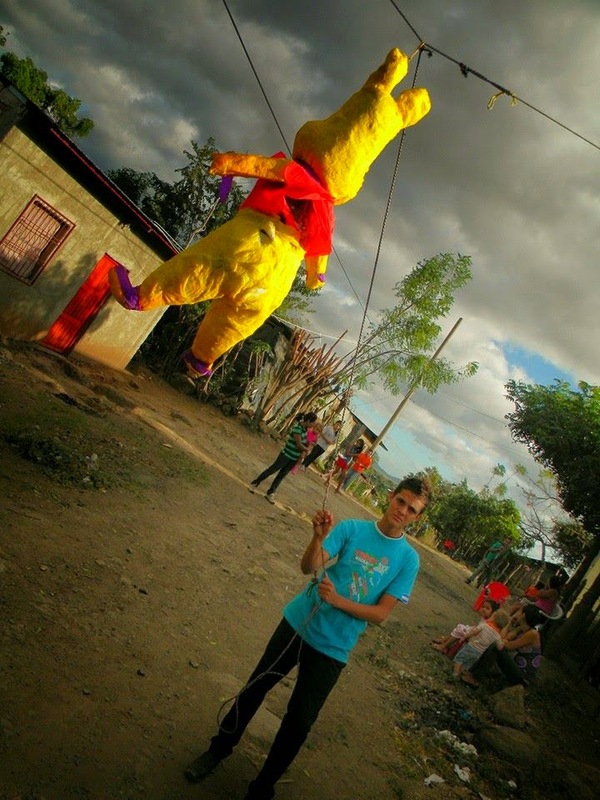 In Nicaragua, Jairo explained to us, many people make piñatas to sell for side money. Many times the materials are inferior because that’s all they can afford. The pooh we had purchased was actually one of the better piñatas he had seen, Jairo commented, as the Mexican side of the team exchanged incredulous looks. The insides were stuffed with newspaper, but there was enough space for a bit of candy, which was the most most people could afford. Unfortunately, it was not enough space for the eight bags of candy we had bought for the event, so Ruth and Cecy began removing newpaper from the unlikely piñata, which I dubbed Pika-Pooh, for his resemblance to both Winnie-the-Pooh and Picachu. Once the bear was stuffed, Jairo mounted some speakers on the top of his pickup, called the kids to get ready, and we started walking. Jairo called through the speakers to all the children within hearing distance that there was a piñata to be broken, and they began to empty out of their houses in droves, bring parents, siblings, and pets with them. All the while, we continued to move around the poorer section of Darío, where the homes were made of corrugated sheet metal instead of stone, and the streets were dirt instead of pavement. Finally we stopped, and I realized what we had been looking for-somewhere to hang the piñata. And when it was all done, we broke the piñata! I’m not going to lie to you, it was absolute insanity was every child wanted a chance to break what was actually a very fragile piñata. Before it was hung, I actually had to take some candy out of it and stash it in Joe’s backpack, because it was too heavy to hang up with out ripping. When that piñata broke, the kids were showered with more candy than they may have ever seen, and I was shouting like a loon, “Break the head, break the head!” because there was even more in the piñata’s paper cranium. Needless to say, it was utter and complete pandemonium, and completely wonderful. After a service with Jairo’s church in the evening, we all piled into missionary Earl Rutledge’s van and headed to the city of Matagalpa, where we would spend the remaining days of our trip. Wisdom is vindicated by all her children. There are three effects of nearness to Jesus: humility, happiness, holiness. The day a company (or ministry) begins to be run for the benefit of the insiders, and not the benefit of the customers (those outside itself), is the day that the institution begins to die. Much of what is being espoused as relationship-based Christianity is referring to a relationship with someone’s position or organization. By this we are being robbed.